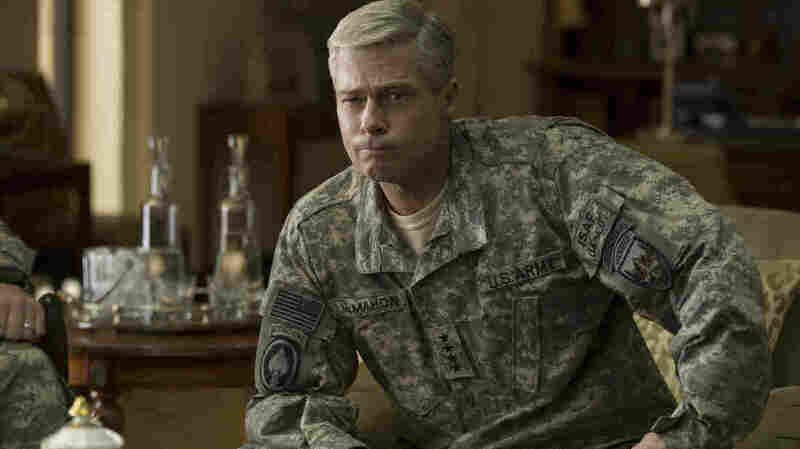 Trying To Wring Entertainment Out Of A Quagmire In 'War Machine' War Machine, a Netflix production based on a book about the drawn-out U.S. military operations in Afghanistan, suffers from a one-note Brad Pitt performance and a frustrating lack of focus. Afghanistan has been dubbed the "graveyard of empires" for punishing the hubris of powerful invaders, but eight years after the 9/11 attacks lured American forces to Afghanistan, it had become more like a purgatory. With anything like a clear-cut victory long off the table and the "coalition of the willing" whittled down to half-hearted, qualified commitments from U.S. partners abroad, the mission had lapsed into dangerous inertia. The new President, Barack Obama, was looking to draw down troops in Iraq and Afghanistan, but ending the war completely was never a viable option. The best that could be achieved was a rosier version of the status quo. Based on Michael Hastings' book The Operators, War Machine is an expensive new Netflix production that premieres on the service this weekend and faces the difficult prospect of turning a quagmire into an entertainment. Writer-director David Michôd, an Australian known for hard-nosed and audacious thrillers like Animal Kingdom and The Rover, doesn't have the luxury of unambiguous wins and losses or even the purposefulness that's usually inherent in war films. There have been a handful of good films about rudderless conflicts, like Robert Altman's Korean War comedy M*A*S*H, which fills the downtime with pranks and misbehavior, or David O. Russell's Three Kings, which breaks off from Gulf War I to stage a thrilling, politically loaded variation on The Treasure of the Sierra Madre. The key is a strong point of view, because a straight telling of the events risks the same rudderless feeling the film is trying to articulate. And it's here where War Machine fails, despite its abundant insight into the War in Afghanistan and Michôd's meticulous staging of bloody conflicts in strategy meetings and hotel rooms, as well as on actual fields of Helmand Province in southern Afghanistan. It's not quite a satire or a journalistic drama or a boots-on-the-ground thriller, but a vague, two-hour amalgam of all three, with no clear perspective to carry it across. Before it was expanded into The Operators, Hastings' 2010 Rolling Stone piece "The Runaway General" led to the removal of its subject, Army Gen. Stanley McChrystal, from his post as commander of NATO's International Security Assistance Force (ISAF). Hastings' article detailed the shortcomings of McChrystal's counterinsurgency strategy and recklessness by those in his inner circle, who Hastings reported were given to heavy drinking and open disparagement of Obama, Vice President Joe Biden, and their civilian bosses. War Machine changes the names of several figures, including McChrystal and a fiery stand-in for Michael Flynn, but Michôd nonetheless devotes himself to a down-the-middle retelling of the events. Reprising the cartoon drawl of his Lt. Aldo Raine character from Inglourious Basterds, Brad Pitt stars as McChrystal stand-in Gen. Glen McMahon, a dynamic and battle-tested leader who takes bold steps to succeed where others have failed. With a devoted cadre of advisors, assistants, and PR experts behind him, McMahon decides to bring the fight to Helmand Province, a Taliban stronghold that's frustratingly intractable. Believing that 40,000 additional troops will do the job, McMahon sets on a two-pronged mission to manipulate the U.S. government into temporary escalation and press European allies into a deeper engagement. Despite Pitt's distracting one-note performance, War Machine considers its McChrystal surrogate in a gratifyingly sophisticated light, weighing the ideals of his nation-building strategy against the hubris of putting it into practice. McMahon wants his Marines to defeat the enemy while offering security and the promise of prosperity to ordinary people, but since the enemy is in plain clothes, his men struggle to make that surgical distinction. The film also understands McMahon's frustration with his superiors, who expect success without offering the tools to make it possible—if it was ever possible at all. War Machine fires off some funny shots at the entrenched apathy at that point in Afghanistan — Ben Kingsley, as President Hamid Karzai, is more interested in getting his new Blu-ray player working than meeting the latest general — but it's similarly crippled by mission drift. McMahon and his sycophants make for unpleasant and witless company, and when they get stranded in four-star European hotels or in bull sessions before the push into Helmand, their restlessness is depicted all too vividly. Michôd supports Hastings' bitter conclusions about modern war and the lessons we refuse to learn, but without a more forceful hand, the message doesn't sink in.